Good Wedneday to everyone! 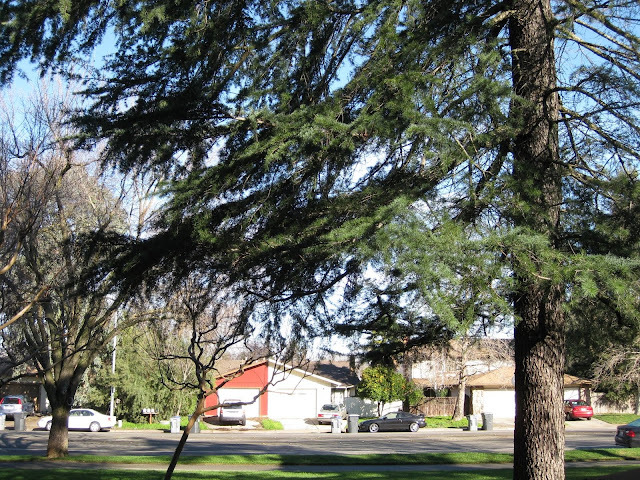 Finally, a sunny day in beautiful Northern California! Not too long ago, I lived to eat. Every day, food was an event. Marathon eating sessions with multiple courses and humongous portions were a mainstay. As my erstwhile roommate Sara's brother DJ once commented, when it was meal time, my friends and I "did food." When I got the urge to eat something, which usually had nothing to do with actual hunger, I was a force to be reckoned with - highly motivated to obtain what I was craving and put it in my body as quickly as possible. Eating was so rewarding (I'm talking ventral striatum-style dopamine let-down, for all you neuroscientists out there) that I just kept eating because I didn't want that wonderful feeling to end. But the high was usually followed closely by remorse and sluggishness, and periods of increased eating inevitably led to more snugly-fitting clothing. Emotionally and physically, this behavior pattern was decidedly unhealthy. I'd tried diets - Atkins, Weight Watchers, Special K, you name it - which almost always meant deprivation, having specific rules about what was not permissible to eat. But, when something is forbidden, it has this funny way of becoming that much more salient. It's like if I told you, "Do not, under any circumstances, think about polar bears." Let me guess: you just thought about a big, white bear. So, all too often on diets, I found myself eating contraband. Once I ate one of those "bad" foods, mentally, that whole day of dieting was shot, and eventually I just reverted to my regular eating ways. For brief periods, I also engaged in calorie counting. With calorie counting, if you have that burrito, muffin, pina colada, and/or cheeseburger, you still have to hold yourself accountable - you have to count those calories. So, keeping these records taught me more about the nutritional content of different foods, and helped me figure out what healthier choices might be. However, at the end of every single day that I restricted my intake to my goal calorie limit, I had so little energy that I could not get off the couch, even to do something fun, let alone go to the gym. Leave it to running to change my perspective on and my approach to food. If I was exhausted and famished from restricting my diet, or bloated and comatose from overindulging, there was no way I could complete the day's training run. Because I was committed to my running, I needed to start eating like an athlete! And, like a good little scientist, I did my research. I read literature on why to eat what foods and when in order to run your best. When I applied these principles to my actual eating, incredibly, it worked! I felt more energized before a run, happier after a run, and stronger during runs than I knew was possible! Food became linked to the experience of running, and linked positively rather than negatively. Instead of thinking, "I can't eat Food X," and "Food Y is bad for me," I started thinking about how "I need to eat Food A," and "Food B is good for me." For the first time, food wasn't just for eating - it was fuel! Too often, I've seen new runners make cardinal nutrition mistakes (which may stem from their own history of engaging in "diet-think"). How you fuel before, during, and after a run can make a huge difference for your running performance and enjoyment! Here are some basic guidelines of fueling for running, combined with examples of what I eat to fuel. All day, every day... Drink up! Hydration is fundamental for athletes. Our bodies are mostly water, and, during exercise, water keeps us cool and flushes the waste and toxins produced by our muscles. If you are dehydrated before a run, your performance and mood with both suffer. After a run, it's important to replace the water you've sweated out - and runners sweat - for every pound you lose on a run, you should drink 8 fl. oz. of good ol' H2O. I carry a bottle of water with me all day that I refill constantly. I'm so used to being properly hydrated that if I go even an hour without a sip, I feel parched. Perhaps it's psychological, but at least I know I'm staying hydrated. As you sweat during a run, you lose not only water but also electrolytes, substances like sodium, calcium, and potassium. Quite literally, electrolytes conduct electricity, and nerves use electrical signals to communicate with each other and control your muscles. Severe electrolyte deficiency is a very dangerous condition to which endurance athletes are particularly susceptible. Below, I talk about options for electrolyte replacement during workouts. Before the run... Slow carbs, some fast carbs, and a little protein! Whole grains, which have complex carbohydrates that are processed more slowly in digestion, provide a steady source of energy for the run. Before longer runs (5-13 miles) I often fuel up with multi-grain hot cereal, which is also an awesome source of both fiber and protein! Simple carbs are burnt off during activity very quickly, giving your muscles a "burst of energy," but they also are stored more readily as fat if not immediately metabolized. 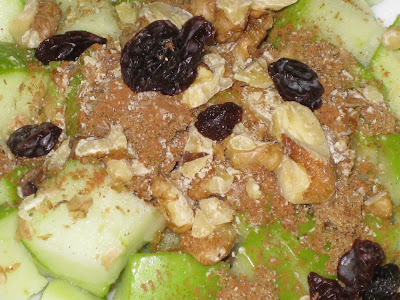 I'll top hot cereal with fresh and dried fruit, and a little brown sugar, as well as some cinnamon for flavor. Finally, nuts (walnuts here) provide protein and some monosaturated "good fats," which keep you full and round out the nutritional content of a meal. 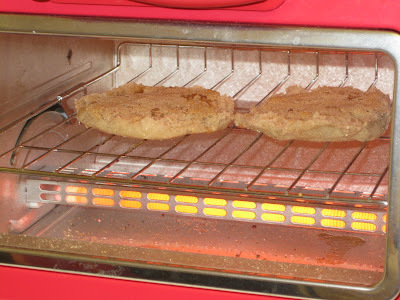 Or, I'll fuel with a toasted multi-grain English muffin - these are a favorite especially before shorter runs (3-5 miles) because they're a little lighter than oatmeal. I'll put anything on them, from bananas and PB (fast carbs and protein) to cottage cheese and tomatoes (protein and fast carbs!). Yummm! Also, a moderate dose of caffeine can jump-start the brain for those early-morning treks, and it turns out a little coffee can also give your legs an added jolt! I drink one (large) mug before heading out, as well as plenty of water. Yes, my coffee maker matches my toaster oven, thanks for asking. Importantly, if you are a morning runner like moi, you may not have much time to wait between fueling and hitting the pavement. So, I keep my pre-run cuisine as tummy-friendly as possible. During the run... Fast carbs, electrolytes, and H-to-the-O! As a rule of thumb (unless you are running in extreme heat), it probably isn't necessary to fuel or hydrate during a training run until you are running for ninety minutes or longer. When it is time for that long-long run, there are a lot of choices for mid-run food and bev. You see distance runners making a big deal out of supplement gels or "Gu's" - ripping open a plasticky packet with your teeth and shooting back a glob of viscous, artificially-flavored slime mid-stride is practically a runner's rite of passage. But, there are many different gooey and non-gooey options for mid-run carbohydrate and electrolyte replenishment. Brands like Clif and Gatorade make gummy chews (e.g. Shot Bloks), jelly beans (e.g. Sport Beans), or other candy-like supplements that might trick you into thinking you're eating a delicious treat - but you're really replacing the energy and nutrients that you've burned off and sweated out. Some energy bars like my favorite PB-flavored PowerBar are designed to help you sustain a tough workout - but, I personally find them a bit too hard to chew on the go and prefer them as a pre-run snack. 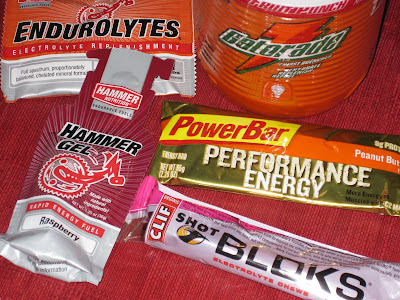 Endurolytes by Hammer (above, left over from a recent race goody bag) are tablets that you can swallow to help replace electrolytes, but they don't contain carbs. Mid-run hydration can be tricky, but, unless your long run routes are serendipitously peppered with water fountains, you will need to bring along some liquid. It's not uncommon for a runner to stash water bottles at strategic points along a route, diving in and out of shrubbery to retrieve them every few miles. Renata employed this very tactic on our 11-miler this past Sunday, which I found to be amusing but also ingenious. Then - no littering! - she had to carry the empty bottles with her until we ran past a trash bin. 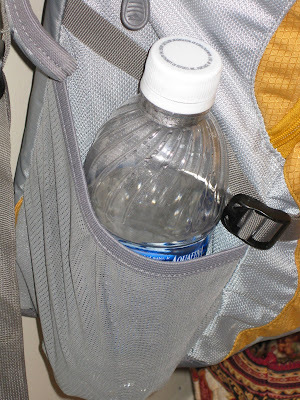 Many runners own hydration belts and can carry small water bottles around the waist for easy access and stowage. Tristan, who ran the Healdsburg Half with me, swears by hers. 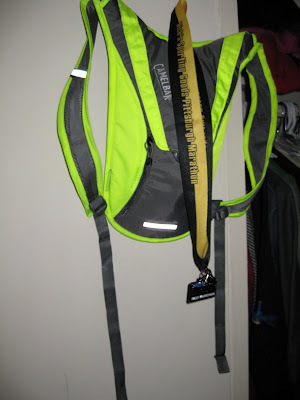 I started training with my "visible"-colored CamelBak for the Pittsburgh Half. Now it lives in my fridge full of Gatorade, ready for my next long run. Never mind the whipped cream, it's a long story. Importantly while running, know thyself. As you train for a race, pay attention to your body's needs during your long runs. When you feel yourself become excessively overheated or thirsty, you might consider bringing hydration along. If you start to feel your blood sugar drop after five or six miles, that's when you need to take a supplement - and then another one five or six miles later at most! After the run... Protein, water, and some carbs! Right after you finish a workout, it turns out that you have a very short window of time in which your muscles will maximally absorb nutrients. Within twenty or thirty minutes of finishing a run, particularly a hard run, you need to ingest food that is high in protein and contains some simple carbohydrates. That way, your muscles will recover more efficiently and be optimally fresh for your next run. In other words, fueling properly directly after a run can help you avoid future feelings of "lead legs." 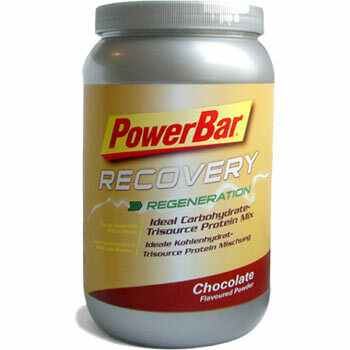 There are nutritional supplements specifically designed for post-workout consumption, such as drink mixes by Muscle Milk or PowerBar. These formulas are purportedly optimally formulated for absorption (they are highly soluble and have the proper "balance" of nutrients), but, in actuality, real food can serve your recovery just as well (although it is admittedly less handy). Nonfat milk is a great recovery drink. 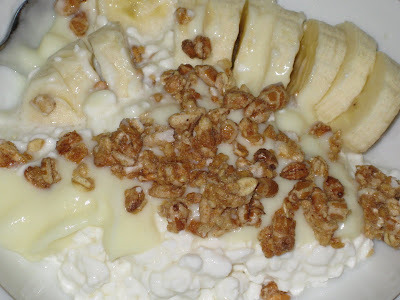 Fruit combined with a source of protein like cottage cheese or yogurt is also excellent. In fact, this combination, sometimes topped with some crunch like Kashi cereal, is a favorite post-run snack of mine. If you are recovering from a long run, still eat recovery food immediately after finishing (and stretching). But, your body will plow through that snack rapidly, so it's imperative to eat a real meal no longer than an hour and a half after your snack. Remember, if you ran 10 miles, you just burned around 1,000 calories! So, it's important to replace that energy in your body. These meals should also be high in lean protein and contain complex carbohydrates (veggies, whole grains, etc.). Because I'm usually verrrry hungry at this point, I go for a nice, big deli sandwich on wheat, or even some frozen pizza with chicken. Although the rule about post-workout recovery fueling is probably uncommonly known, my Boyfriend, who is very experienced in fitness, has been telling me about it for years. Once I tried it, I was amazed. The day after a particularly tough run, I could really feel the difference in my endurance and speed. No more lead legs! OK, as I've described it, this fueling thing seems a little complicated. As a runner, it is necessary to be extra mindful of what you're eating and when you're eating it. As Jin exclaimed after class on Monday, "It's like you need to plan your whole eating schedule around running!" That might be only a bit of a hyperbole, but fueling for running is worth it. Starting a run hungry is always a bad idea. If you get hungry in the middle of a short run, you probably didn't fuel sufficiently. It might take some trial and error, but it's important to figure out pre-run fuel that works for your stomach. Long runs will be much more manageable if you bring along liquid and some kind of supplement. And your training plan will be much more effective if you give your muscles what they need to recover. You've been working too hard towards your running goal - be it a particular race or just general fitness - to let improper fueling get in the way. Instead, done thoughtfully, what you eat can help your running! 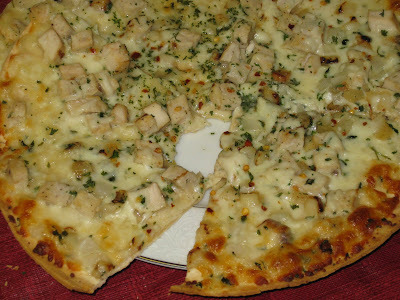 Of course, I still love food and believe that eating a delicious dish is one of the greatest pleasures in life. For instance, I spend all of one week thinking about what I'll make for dinner the next. 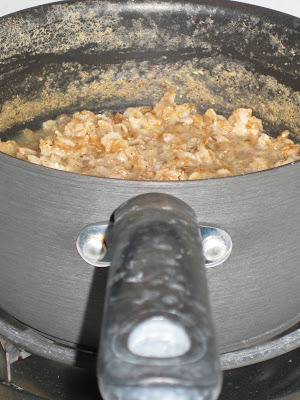 But, I think about it in terms of combining flavor with proper fuel. And I've learned to say "no" to food when it may not be a good fuel choice, and "yes, please!" to foods that would! Thanks, guys, for reading, and I'm very curious about your opinions on the above information and fueling in general. Today's question: How do you fuel? What do you eat before a workout? Do you carry water on your runs? What supplements have you tried, and what did you think of them? you are an inspiration to me and i hope one day i am as healthy as you are. Sadly, I probably do not hydrate enough during a run. There are times (my 8/10 milers) where I don't drink until afterwards! Bad, I know. I drink plenty afterwards though. Wow, girl, this is such a well-thought and well-written post. I think every woman can relate to what you said, about emotional eating, and the constant dieting and calorie-counting...enough to drive anyone crazy! I'm glad you found a good relationship with food, and to view it in a more healthy way. I don't workout very hard, so I don't really fuel before...And again, I don't work out long enough to need to carry water. I don't take supplements, I don't really believe in them; I'd rather just get my nutrients from whole foods. This was such a helpful post! 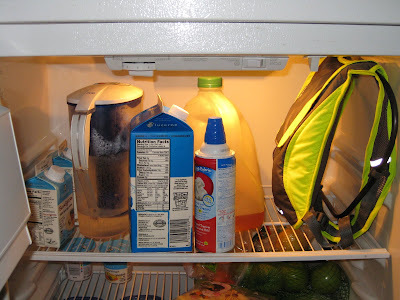 You have inspired me to look into mid-run fuel options...and maybe even a camelback? Great post Laura! I've been looking forward to reading your nutrition post since you mentioned it a few days ago. As you know, I haven't given enough thought to nutrition, as you witnessed on the treadmill with me that one day. I also don't hydrate enough throughout the day.. 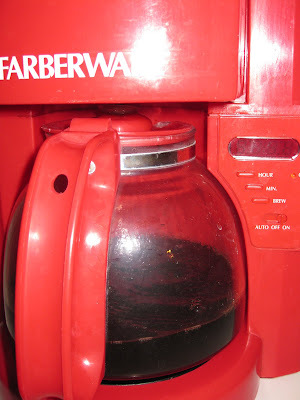 I have my large coffee in the morning (essentially a dehydrator) and can essentially go without water until dinnertime. It seems hard to change such ingrained habits sometimes though! So helpful and well-written, thanks Laura! To answer your questions, my fueling depends on swim, bike, or run. I always eat a banana before a swim because it's light, easy on my stomach, and I've learned I can eat one right before a swim and not have stomach cramps. Otherwise, multi-grain cereals, cliff bars, apples, and PB&J's are my pre-workout choice. I don't fuel during workouts unless it's a long bike ride on a hot day. I use GU energy gels only during triathlons, 30 minutes before the swim, and every 30 minutes during the bike and swim. Fantastic post! I think you got it right on the nose. These are some great tips, and they sound just about as accurate as they can get. OF course, everyone is different, but overall, this is what I recommend. I just found your blog and really enjoyed this post! I have started running more than I have in the past and these were great tips!